Hello, my name is Athena just like the Goddess of Wisdom. 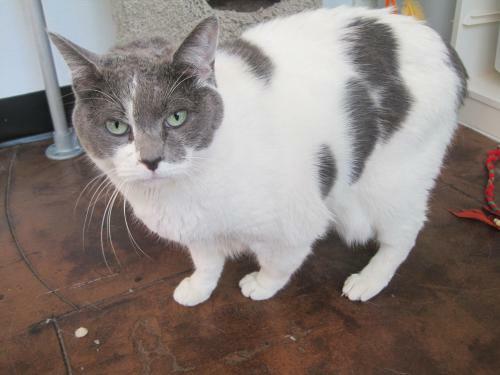 I am wise beyond my years, at least wise enough to know that someone is missing out on a home with a terrific kitty! I am very sweet and quiet, and need a little time to come out of my shell. Once I get to know you, I am the best lap cat youll ever meet! I am 7 years old, spayed, microchipped, and vaccinated. My adoption fee is $100. I am currently living in foster care so fill out an application and we can schedule a meet and greet! Update 5/13/11 from foster mom: I have fostered Athena for several months now. Initially she was shy- for about 2 hours! Then she surprised me by turning into one of the most loveable and fun cats I have known. I will often wake up to find her snuggled and purring under my arm…yes, she likes to snuggle. She never wakes me up before it is time, but loves to have a few minutes first thing in the morning. She loves to play with feather toys, and nibble on cat grass. I bought her a wicker basket bed and put a blanket inside and she is perfectly content. She greets me every day at the door and chats for a few minutes when I first get home. She also likes to eat…and would probably eat all day if a full bowl of food was left out all the time. She will make someone a wonderful kittie- she is that kind of cat-dog who was meant to be with people, and is very social. I hope you will take her home and make her a part of your family.